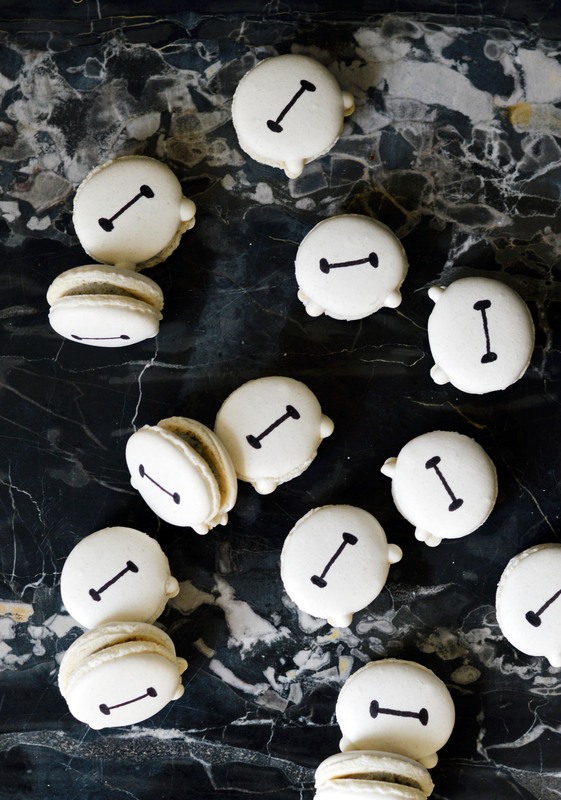 I’ve always been intimated by shaped macarons. If you look back on my archives, they’re mostly round with details added to them. But recently, I made Hello Kitty macarons and I learned that it is quite easy to do as long as you use a smaller piping tip. The key is understanding that macaron batter is not like frosting, it moves and doesn’t make crisp lines without help. 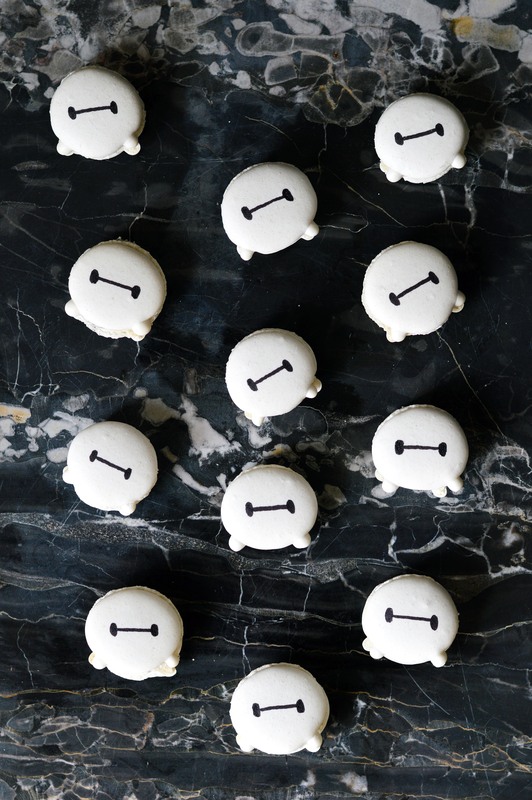 As you know, I have made Baymax macarons before, but never posted a tutorial on it. So this time, I added tiny hands to make it a little more dimensional and fun. I think that if you’ve made macaron batter before, then this is possibly the easiest shaped macaron you can do. These were filled with black sesame frosting which was quite interesting, and have their own post coming up. But before I post that one, I have an amazing chocolate banana bread recipe I want to share. So there is something to look forward to soon! Prepare two piping bags each fitted with the ½ inch round tip and the #2 tip. Divide ⅞ of the batter into the ½ inch round tip bag and ⅛ of the batter into the #2 tip bag. Once cool, find a match for each macaron sandwich. Sometimes the hands will not line up perfectly, that is okay. Fill each half with frosting and sandwich together. 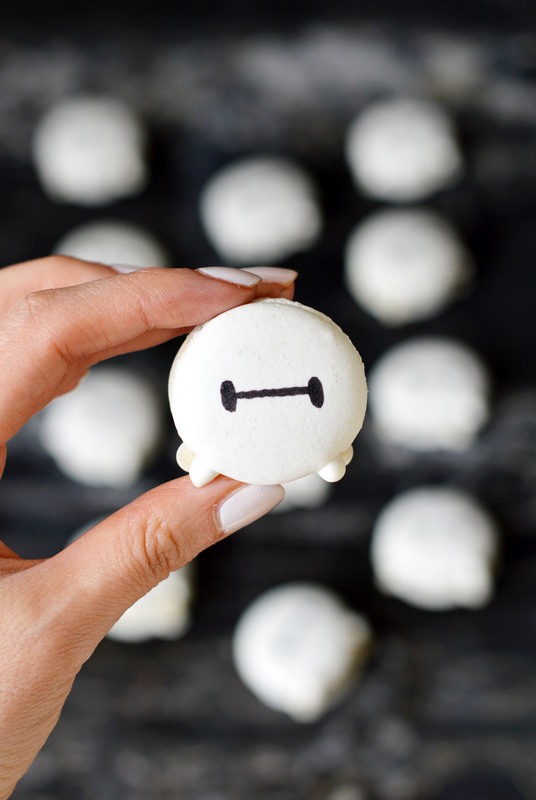 This entry was posted in Cookies, Desserts, Disney, Macarons and tagged baymax, baymax macarons, bighero6, Cookies, disney, macaron, Macarons. Bookmark the permalink.